Straight away you’re introduced the HHC, His Holiness’s Cat, and from then on, the book is from her perspective. She learns her lessons from the enlightened and rich environment she lives in and her keen observations of those around her. Throughout her journey she ponders topics that affect humans and felines alike, all the while taking advantage of her celebrity status. You’ll never again think your cat is just lounging all day! 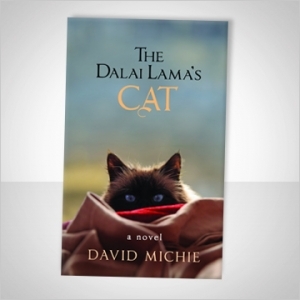 David Michie has had two follow up books; The Dalai Lama’s Cat and the Art of Purring and The Power of Meow. Since this I enjoyed his first book so much, I will be adding these to my reading list. The Dalai Lama’s Cat is an interesting read that’s light and positive and perfect for any cat lover! Two paw rating!